The first development under construction at the UWM Innovation Campus is the UWM Innovation Accelerator Building. This facility will allow UWM faculty, staff and students to conduct research, creating results with potential business benefits. Challenges for this project included extensive coordination with habitat specialists, overall park infrastructure and utility consultants, and the UWM Foundation to ensure that the first project within the campus met the long range concepts iterated in the Master Plan. 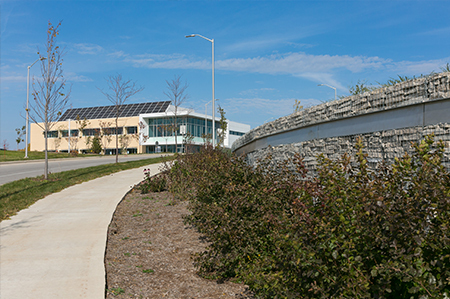 The Innovation Campus is an urban oasis providing natural habitat for a multitude of animals, birds, and insects, including a unique and important resting point for the migratory patterns of the Monarch butterfly. The project desires to not only be part of this historic and ecologically significant ecosystem, but as the first of several commercial developments, intends to lead the re-establishment of natural habitat. The UWM Innovation Accelerator Building project is seeking LEED certification and incorporates sustainable landscaping, natural storm water management, and ecological habitat creation.